ENERGY STAR is a good tool to help narrow down the options so you can select the window glass package that best fits your needs. As you might expect, different combinations of window features are more beneficial in different climates. 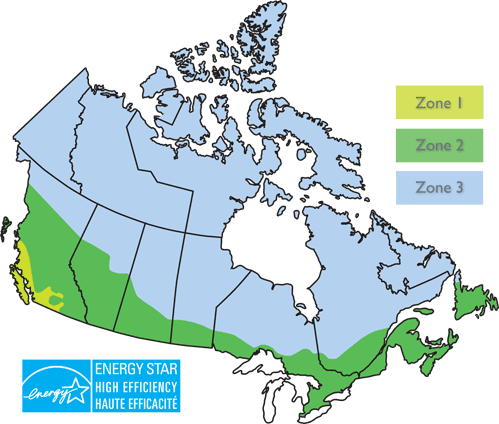 In Canada, three climate zones have been identified based on an average annual temperature indicator called a heating degree-day (HDD). The higher the average HDD value, the colder a location and the longer the heating season is, usually with very cold winter temperatures. In general, window air leakage is important across all zones while insulation (U-Factor) and allowing heat from the sun to passively warm your home (higher SHGC) are more important as you move North. U-Factor – measures how well the window prevents heat from entering or escaping the home. Ratings generally fall between 0.2 and 1.25. Windows with a lower U-Factor provide better insulation. U-Factor is important wherever you live, but is a primary concern for homes in colder Northern climates. Solar Heat Gain Coefficient (SHGC) – measures how much heat from the sun is blocked. This number can range from 0 to 1 where windows with lower numbers reflect more heat. This is particularly important during the summer in hot Southern climates. Visible Transmittance (VT) – measures how much light comes through the whole window. Ranging from 0 to 1, windows with higher numbers allow more light into the home. Air Leakage – measures how much outside air comes into the home through a closed window. Rates typically fall in a range between 0.1 and 0.3*. The lower the air leakage number, the lower the potential for draft through the window. Condensation Resistance (CR) – measures how well the window resists the formation of condensation on the inside of the window. CR is expressed as a number between 1 and 100. The higher the number, the better the window is able to resist condensation. Choosing the right glass for where and how you live is the best way for you to get the most from your new windows. As you make this important decision, keep in mind how the windows will look, the amount of light you want coming in to your home and the level of insulation that will make you the most comfortable. Select your zone below, and choose the glass option that best fits your needs. Your Sunrise dealer can make a recommendation to you for what is best for your area.